Stormcharge was one of 14 small and medium sized companies which was awarded a share of a £2 million defence innovation fund and Harriett met with Tenbury-based Dan Davies who briefed her on the work it is doing with the Ministry. The company started out developing battlefield computer games and is using the technology to control un-manned vehicles remotely. One of its latest project involves working with a consortium to deliver autonomous public transport in Helsinki. Markus Kantonen, CEO and founder of Stormcharge said: “The competition from the Centre for Defence Enterprise has given our team a vital opportunity to prove the tangible and durable value of our innovative technologies for autonomous vehicles not only in defence but other sectors. 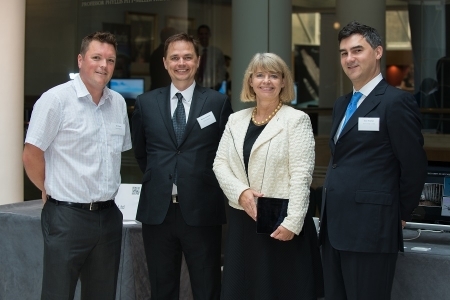 Photo: (l-r) Stormcharge’s Dan Davies, Markus Kantonen, Harriett Baldwin MP and Alex Newman.